For other uses, see Precession (disambiguation). Torque-free precession implies that no external moment (torque) is applied to the body. In torque-free precession, the angular momentum is a constant, but the angular velocity vector changes orientation with time. What makes this possible is a time-varying moment of inertia, or more precisely, a time-varying inertia matrix. The inertia matrix is composed of the moments of inertia of a body calculated with respect to separate coordinate axes (e.g. x, y, z). If an object is asymmetric about its principal axis of rotation, the moment of inertia with respect to each coordinate direction will change with time, while preserving angular momentum. The result is that the component of the angular velocities of the body about each axis will vary inversely with each axis' moment of inertia. where ωp is the precession rate, ωs is the spin rate about the axis of symmetry, Is is the moment of inertia about the axis of symmetry, Ip is moment of inertia about either of the other two equal perpendicular principal axes, and α is the angle between the moment of inertia direction and the symmetry axis. When an object is not perfectly solid, internal vortices will tend to damp torque-free precession, and the rotation axis will align itself with one of the inertia axes of the body. Another type of torque-free precession can occur when there are multiple reference frames at work. For example, Earth is subject to local torque induced precession due to the gravity of the sun and moon acting on Earth's axis, but at the same time the solar system is moving around the galactic center. As a consequence, an accurate measurement of Earth's axial reorientation relative to objects outside the frame of the moving galaxy (such as distant quasars commonly used as precession measurement reference points) must account for a minor amount of non-local torque-free precession, due to the solar system’s motion. Torque-induced precession (gyroscopic precession) is the phenomenon in which the axis of a spinning object (e.g., a gyroscope) describes a cone in space when an external torque is applied to it. The phenomenon is commonly seen in a spinning toy top, but all rotating objects can undergo precession. If the speed of the rotation and the magnitude of the external torque are constant, the spin axis will move at right angles to the direction that would intuitively result from the external torque. In the case of a toy top, its weight is acting downwards from its center of mass and the normal force (reaction) of the ground is pushing up on it at the point of contact with the support. These two opposite forces produce a torque which causes the top to precess. The device depicted on the right (or above on mobile devices) is gimbal mounted. From inside to outside there are three axes of rotation: the hub of the wheel, the gimbal axis, and the vertical pivot. To distinguish between the two horizontal axes, rotation around the wheel hub will be called spinning, and rotation around the gimbal axis will be called pitching. Rotation around the vertical pivot axis is called rotation. First, imagine that the entire device is rotating around the (vertical) pivot axis. Then, spinning of the wheel (around the wheelhub) is added. Imagine the gimbal axis to be locked, so that the wheel cannot pitch. The gimbal axis has sensors, that measure whether there is a torque around the gimbal axis. In the picture, a section of the wheel has been named dm1. At the depicted moment in time, section dm1 is at the perimeter of the rotating motion around the (vertical) pivot axis. Section dm1, therefore, has a lot of angular rotating velocity with respect to the rotation around the pivot axis, and as dm1 is forced closer to the pivot axis of the rotation (by the wheel spinning further), because of the Coriolis effect, with respect to the vertical pivot axis, dm1 tends to move in the direction of the top-left arrow in the diagram (shown at 45°) in the direction of rotation around the pivot axis. Section dm2 of the wheel is moving away from the pivot axis, and so a force (again, a Coriolis force) acts in the same direction as in the case of dm1. Note that both arrows point in the same direction. The same reasoning applies for the bottom half of the wheel, but there the arrows point in the opposite direction to that of the top arrows. Combined over the entire wheel, there is a torque around the gimbal axis when some spinning is added to rotation around a vertical axis. It is important to note that the torque around the gimbal axis arises without any delay; the response is instantaneous. In the discussion above, the setup was kept unchanging by preventing pitching around the gimbal axis. In the case of a spinning toy top, when the spinning top starts tilting, gravity exerts a torque. However, instead of rolling over, the spinning top just pitches a little. This pitching motion reorients the spinning top with respect to the torque that is being exerted. The result is that the torque exerted by gravity – via the pitching motion – elicits gyroscopic precession (which in turn yields a counter torque against the gravity torque) rather than causing the spinning top to fall to its side. Precession or gyroscopic considerations have an effect on bicycle performance at high speed. Precession is also the mechanism behind gyrocompasses. 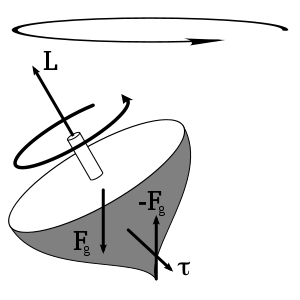 The torque caused by the normal force – Fg and the weight of the top causes a change in the angular momentum L in the direction of that torque. This causes the top to precess. Precession is the result of the angular velocity of rotation and the angular velocity produced by the torque. It is an angular velocity about a line that makes an angle with the permanent rotation axis, and this angle lies in a plane at right angles to the plane of the couple producing the torque. The permanent axis must turn towards this line, because the body cannot continue to rotate about any line that is not a principal axis of maximum moment of inertia; that is, the permanent axis turns in a direction at right angles to that in which the torque might be expected to turn it. If the rotating body is symmetrical and its motion unconstrained, and, if the torque on the spin axis is at right angles to that axis, the axis of precession will be perpendicular to both the spin axis and torque axis. Where Is is the moment of inertia, Ts is the period of spin about the spin axis, and τ is the torque. In general, the problem is more complicated than this, however. There is a non-mathematical way of understanding the cause of gyroscopic precession. The behavior of spinning objects simply obeys the law of inertia by resisting any change in direction. If a force is applied to a spinning object to induce a change the direction of the spin axis, the object behaves as if that force was applied at a location exactly 90° ahead, in the direction of rotation. This is why: A solid object can be thought of as an assembly of individual molecules. If the object is spinning, each molecule's direction of travel constantly changes as that molecule revolves around the object's spin axis. When a force is applied that is parallel to the axis, molecules are being forced to move in new directions at certain places during their path around the axis. These new changes in direction are resisted by inertia. Imagine the object to be a spinning bicycle wheel, held at both ends of its axle in the hands of a subject. The wheel is spinning clock-wise as seen from a viewer to the subject’s right. Clock positions on the wheel are given relative to this viewer. As the wheel spins, the molecules comprising it are travelling vertically downward the instant they pass the 3-o'clock position, horizontally to the left the instant they pass 6 o'clock, vertically upward at 9 o'clock, and horizontally to the right at 12 o'clock. Between these positions, each molecule travels components of these directions, which should be kept in mind as you read ahead. The viewer then applies a force to the wheel at the 3-o'clock position in a direction away from himself. The molecules at the 3-o'clock position are not being forced to change their direction when this happens; they still travel vertically downward. Actually, the force attempts to displace them some amount horizontally at that moment, but the ostensible component of that motion, attributed to the horizontal force, never occurs, as it would if the wheel was not spinning. Therefore, neither the horizontal nor downward components of travel are affected by the horizontally-applied force. The horizontal component started at zero and remains at zero, and the downward component is at its maximum and remains at maximum. The same holds true for the molecules located at 9 o'clock; they still travel vertically upward and not at all horizontally, thus are unaffected by the force that was applied. However, molecules at 6 and 12 o'clock are being forced to change direction. At 6 o'clock, molecules are forced to veer toward the viewer. At the same time, molecules that are passing 12 o'clock are being forced to veer away from the viewer. The inertia of those molecules resists this change in direction. The result is that they apply an equal and opposite reactive force in response. At 6 o'clock, molecules exert a push directly away from the viewer, while molecules at 12 o'clock push directly toward the viewer. This all happens instantaneously as the force is applied at 3 o'clock. Since no physical force was actually applied at 6 or 12 o’clock, there is nothing to oppose these reactive forces; therefore, the reaction is free to take place. This makes the wheel as a whole tilt toward the viewer. Thus, when the force was applied at 3 o'clock, the wheel behaved as if that force was applied at 6 o'clock, which is 90 degrees ahead in the direction of rotation. Precession causes another phenomenon for spinning objects such as the bicycle wheel in this scenario. If the subject holding the wheel removes one hand from the end of the axle, the wheel will not topple over, but will remain upright, supported at just the other end of its axle. However, it will immediately take on an additional motion; it will begin to rotate about a vertical axis, pivoting at the point of support as it continues spinning. If the wheel was not spinning, it would topple over and fall when one hand is removed. The ostensible action of the wheel beginning to topple over is equivalent to applying a force to it at 12 o'clock in the direction of the unsupported side (or a force at 6 o’clock toward the supported side). When the wheel is spinning, the sudden lack of support at one end of its axle is equivalent to this same force. So, instead of toppling over, the wheel behaves as if a continuous force is being applied to it at 3 or 9 o’clock, depending on the direction of spin and which hand was removed. This causes the wheel to begin pivoting at the point of support while remaining upright. It should be noted that although it pivots at the point of support, it does so only because of the fact that it is supported there; the actual axis of precessional rotation is located vertically through the wheel, passing through its center of mass. Also, this explanation does not account for the effect of variation in the speed of the spinning object; it only describes how the spin axis behaves due to precession. More correctly, the object behaves according to the balance of all forces based on the magnitude of the applied force, mass and rotational speed of the object. Thomas precession a special relativistic correction accounting for the observer's being in a rotating non-inertial frame. de Sitter precession a general relativistic correction accounting for the Schwarzschild metric of curved space near a large non-rotating mass. Lense–Thirring precession a general relativistic correction accounting for the frame dragging by the Kerr metric of curved space near a large rotating mass. Axial precession is the movement of the rotational axis of an astronomical body, whereby the axis slowly traces out a cone. In the case of Earth, this type of precession is also known as the precession of the equinoxes, lunisolar precession, or precession of the equator. Earth goes through one such complete precessional cycle in a period of approximately 26,000 years or 1° every 72 years, during which the positions of stars will slowly change in both equatorial coordinates and ecliptic longitude. 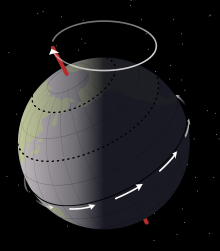 Over this cycle, Earth's north axial pole moves from where it is now, within 1° of Polaris, in a circle around the ecliptic pole, with an angular radius of about 23.5°. Hipparchus is claimed to be the earliest known astronomer to recognize and assess the precession of the equinoxes at about 1° per century (which is not far from the actual value for antiquity, 1.38°). Caltech's Swerdlow disputes Hipparchus's knowledge of precession because Hipparchus apparently did not necessarily indicate anything like a motion of the entire sphere of the fixed stars with respect to the equinoxes. The precession of Earth's axis was later explained by Newtonian physics. Being an oblate spheroid, Earth has a non-spherical shape, bulging outward at the equator. The gravitational tidal forces of the Moon and Sun apply torque to the equator, attempting to pull the equatorial bulge into the plane of the ecliptic, but instead causing it to precess. The torque exerted by the planets, particularly Jupiter, also plays a role. Precessional movement of the axis (left), precession of the equinox in relation to the distant stars (middle), and the path of the north celestial pole among the stars due to the precession. Vega is the bright star near the bottom (right). Apsidal precession—the orbit rotates gradually over time. The orbits of planets around the Sun do not really follow an identical ellipse each time, but actually trace out a flower-petal shape because the major axis of each planet's elliptical orbit also precesses within its orbital plane, partly in response to perturbations in the form of the changing gravitational forces exerted by other planets. This is called perihelion precession or apsidal precession. In the adjunct image, the Earth apsidal precession is illustrated. As the Earth travels around the Sun, its elliptical orbit rotates gradually over time. The eccentricity of its ellipse and the precession rate of its orbit are exaggerated for visualization. Most orbits in the Solar System have a much smaller eccentricity and precess at a much slower rate, making them nearly circular and stationary. Discrepancies between the observed perihelion precession rate of the planet Mercury and that predicted by classical mechanics were prominent among the forms of experimental evidence leading to the acceptance of Einstein's Theory of Relativity (in particular, his General Theory of Relativity), which accurately predicted the anomalies. Deviating from Newton's law, Einstein's theory of gravitation predicts an extra term of A/r4, which accurately gives the observed excess turning rate of 43″ every 100 years. The gravitational force between the Sun and moon induces the precession in Earth's orbit, which is the major cause of the climate oscillation of Earth that has a period of 19,000 to 23,000 years. It follows that changes in Earth's orbital parameters (e.g., orbital inclination, the angle between Earth's rotation axis and its plane of orbit) is important to the study of Earth's climate, in particular to the study of past ice ages. (See also nodal precession. For precession of the lunar orbit see lunar precession). Wikimedia Commons has media related to Precession. ↑ Boal, David (2001). "Lecture 26 – Torque-free rotation – body-fixed axes" (PDF). Retrieved 2008-09-17. ↑ Teodorescu, Petre P (2002). Mechanical Systems, Classical Models. Springer. p. 420. ↑ Swerdlow, Noel (1991). On the cosmical mysteries of Mithras. Classical Philology, 86, (1991), 48-63. p. 59. ↑ Bradt, Hale (2007). Astronomy Methods. Cambridge University Press. p. 66. ISBN 978 0 521 53551 9. ↑ An even larger value for a precession has been found, for a black hole in orbit around a much more massive black hole, amounting to 39 degrees each orbit.